Easy Christmas Recipe,Eggnog Recipe with Alcohol,Free Christmas Recipe, Alcoholic Eggnog Recipe. Christmas is just round the corner and if you wish to try a new eggnog recipe then your search ends here. 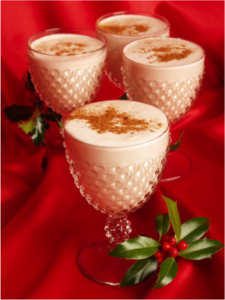 Try out our Exotic Alcoholic Eggnog Recipe that is easy to make and delicious to taste. · Whisk the eggs with egg yolks, sugar and salt in a large pan. · Whisk and slowly pour milk in it until well blended. · Keep the pan on sim flame and keep stirring for about 30 minutes until the mixture easily coats the underside of a knife or spoon. · Remove from heat and strain it in a large bowl. · Add in this mixture vanilla, extract, bourbon and nutmeg. · Cover the bowl and refrigerate for at least 3 to 4 hours. · Now, your Eggnog is ready to be served with alcohol. · Simply, whip the heavy cream and fold it in the chilled eggnog mixture and pour and serve with alcohol.